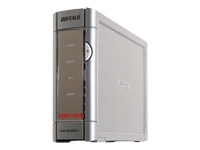 The easy to use LinkStation Live Multimedia Storage Server is perfect whenever you need dependable network data storage. All computers on your network can share files on this versatile, flexible, and simple NAS. In addition to its storage capabilities, it can stream multimedia to a PC, a Mac, a Buffalo LinkTheater, and other DLNA Certified media players. The LinkStation Live seamlessly integrates with iTunes and allows you to access your music files on the LinkStation from your iTunes software. Best suited for homes or small businesses who need a central location for files that all devices on the network can share.